For the past twenty years I have made a range of one off pieces of jewellery using exotic woods, silver, gold and various other materials. Often one piece of jewellery will open up to reveal another. I also enjoy making stands to display my jewellery. I like to use a variety of materials for the warmth of their colours and because they allow a more sculptural approach to design. The ideas for my jewellery come from a wide range of sources. These include antique scientific equipment, ethnographic artefacts such as netsuke and scrimshaw and ideas suggested whilst actually in the process of making . 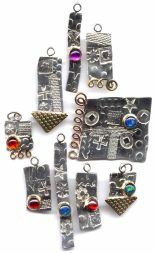 I also work on a range of asymmetrical metal jewellery in partnership with my wife Dawn. 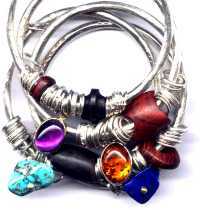 The materials used are un-hallmarked silver, brass and various semi-precious stones such as amber, amethyst, garnet, white moonstone and opal triplet. The silver cannot be hallmarked because it has the brass pieces soldered to it. First a grid is imprinted on the silver sheet. Then stencils are arranged in the squares and roller printed. The earrings are cut up using the grid system into set sizes. An opal, garnet, moonstone, amethyst, or piece of amber will be used on one, while the other will have some brass decoration. to see a wider range of our work and to buy using credit or debit cards.